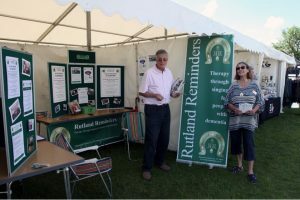 Our volunteers kindly spent the day on the Rutland Reminders stand to share information about the singing therapy sessions we run in Oakham and Uppingham, and to encourage new volunteers to join us. With reportedly a record number of visitors to this year’s show at the Rutland Showground, our volunteers were kept busy chatting with families both affected and unaffected by dementia. Many thanks to all who stopped to meet us and especially to those who signed up as new volunteers! Most of all we’d like to thank all our volunteers involved on the day and in planning the stand. Missed us at the Show? Keep up-to-date on Facebook and on Twitter or contact us on 07779 413889 or info@rutlandreminders.org.uk to find out how you can volunteer with us. Photograph courtesy of Richard Adams.